I’ve always wanted to find a good way to secure and exhibit an object for jewelry. Wire-wrapping was interesting but often clunky and attention-taking. But after a tip from an exhibitor I met at a show in Cambridge, I started exploring macrame techniques. Most of those were too clunky as well, but when I figured out the general concept I was able to develop a more delicate technique that worked for my projects. The stones are from my collection; I’ve picked them up on beaches here in New England as well as Long Island and North Carolina. On the last trip to North Carolina I also started playing with agglomerating stones together. The process is time-consuming but I’m enjoying how it’s coming out. 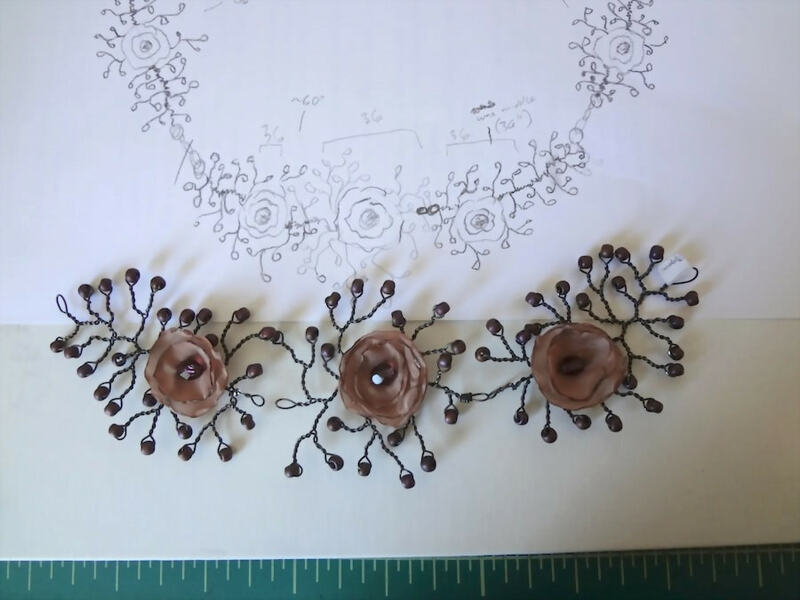 One idea I’ve been playing with is to put them together in a larger necklace form, but there’s also other directions this could go as well. 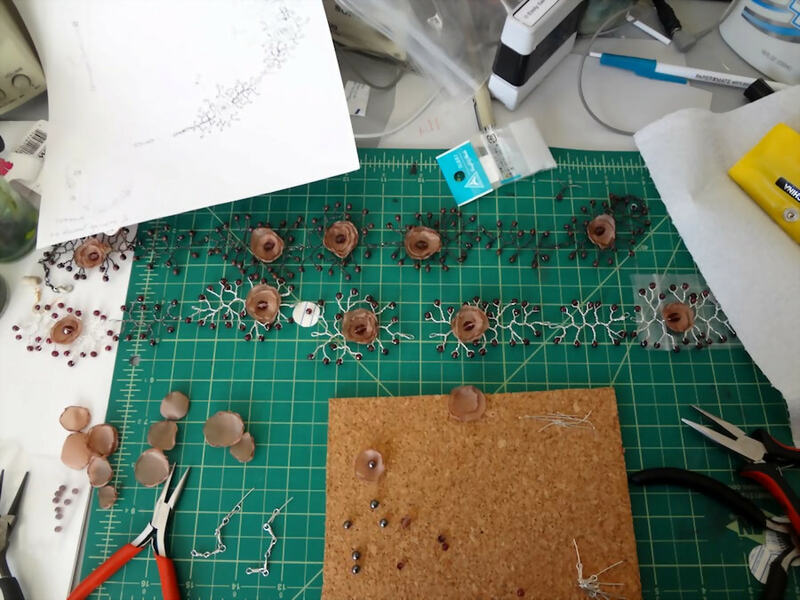 It was certainly a long winter here, and I’m glad to be taking the summer to work on some new projects, including jewelry. I started making macrame bracelets for myself to wear and got pretty excited about working in interesting beads and loom beadwork. I’ve posted one of the bracelets to Etsy—click here to see the listing, and stay tuned for more styles to come over the next few weeks! 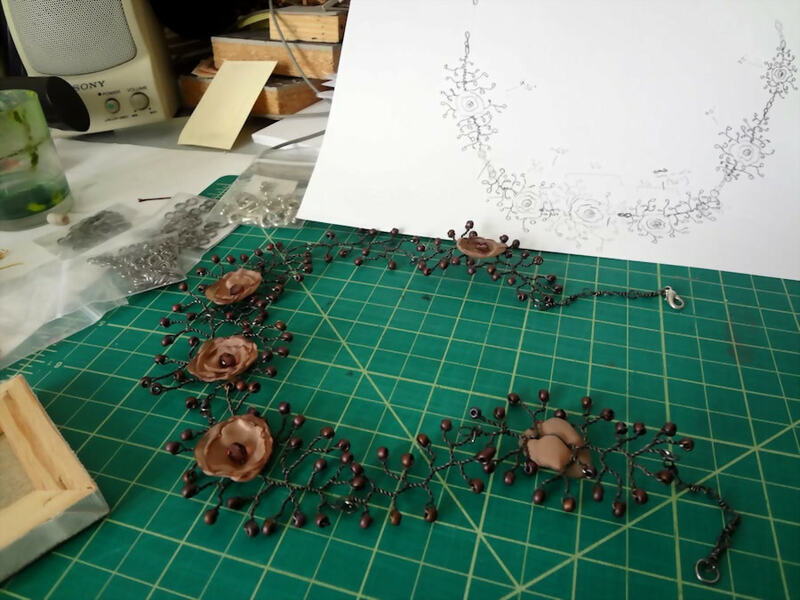 That’s the necklace in silver being measured against the prototype, along with some extra flower parts, extra garnets, and handmade silver chain in progress. I like that the design goes all the way around, and it’s pretty easy to wear but also very striking. 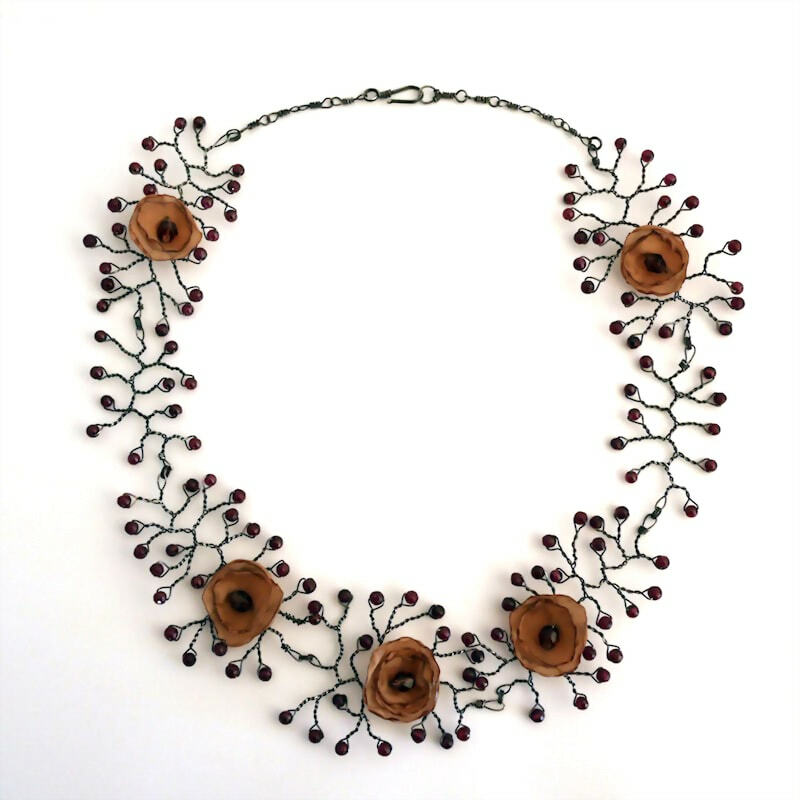 This necklace is on view at Mobilia Gallery as part of their exhibition “Objects of Status, Power and Adornment“, which runs through January 31st. The opening reception is Saturday, December 7th from 3-5pm; I won’t be able to make it, but it’s always a fun time and a good opportunity to meet some of the other artists in the exhibition. 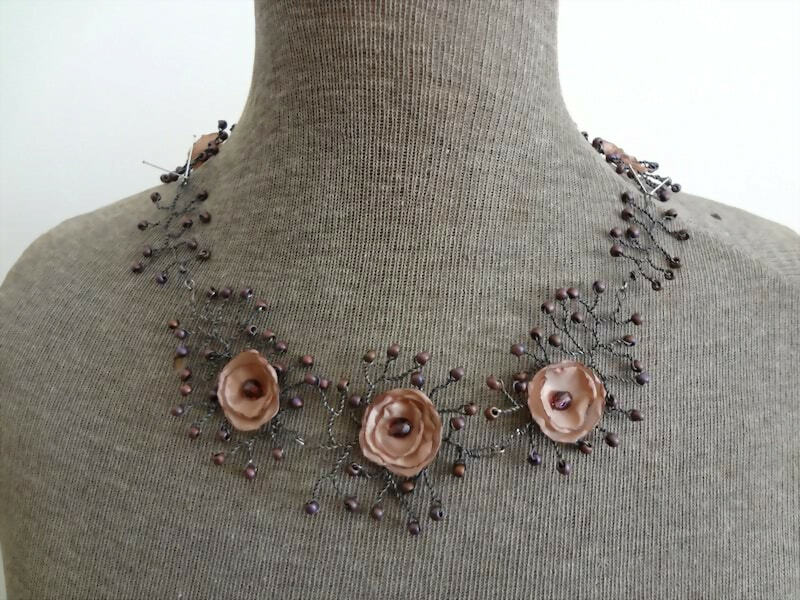 I just completed a large necklace in sterling silver, iolite and singed fabric for Mobilia Gallery‘s exhibition “Objects of Status, Power and Adornment”, which is currently on view. UPDATE: The necklace has been purchased and is no longer on view, though you can still see the photo here and on Mobilia’s exhibition page. I will be working on another one for the gallery shortly!